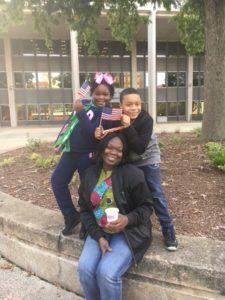 Empty school desks and chairs were arranged on the steps of the U.S. District Courthouse in Bridgeport Tuesday for a press conference with parents of children who have allegedly been denied entry into magnet schools because of their race. A lawsuit filed by eight families with children in the Hartford Public School system against Connecticut Department of Education Commissioner Diana Wentzell and Gov. Dannel Malloy, among others, alleges the racial quota and lottery system for Hartford’s magnet schools prevents minority race students getting a seat in a magnet school. A hearing was held to determine whether to grant the defendants’ motion to keep the issue out of federal court and in the state court system. 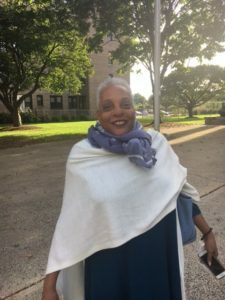 Outside the court, Gwen Samuel, founder of the Connecticut Parents Union, held a press conference and demonstration with children, the plaintiffs, and some empty school desks. “We cannot allow Connecticut – the Constitution State – to say that some kids’ lives matter and some do not,” Samuel said. Current law says a Hartford magnet school must have a student population which is at least 25 percent White or Asian in order to promote diversity under the 1996 State Supreme Court ruling in Sheff v. O’Neill. The Malloy administration tried to revise that quota for magnet schools which cannot achieve that balance to 20 percent, but the administration was denied by Hartford Superior Court Judge Marshall Berger. Ralph Urban, attorney for the state, argued the 75/25 ratio is a goal, not a quota and said the lottery system does not affect the plaintiffs because they are all minorities from Hartford. Thompson and fellow attorney, Wen Fa, argue the quotas violate the Fourteenth Amendment of the U.S. Constitution, commonly known as the equal protection of the laws amendment, which makes the case a federal matter. The State Supreme Court in 1996 ruled in Sheff v. O’Neill that racially segregated schools in Hartford – even if unintentional – violate the state’s constitution. Many of the schools in the Hartford Public School system were deemed to be failing and were comprised largely of minority race students – a fact that has remained unchanged. 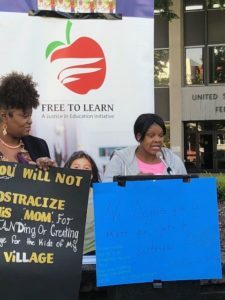 In order to comply with the ruling, Connecticut established a magnet school system and instituted a lottery system for enrollment, but this new lawsuit by Hartford parents could potentially upend the Sheff ruling if it is taken up by the federal court system. Elizabeth Horton Sheff, mother of the lead plaintiff in Sheff v. O’Neill, was also present and believes the diversity standard is necessary for kids of all races to get a good education. She said Hartford’s magnet school system has been largely a success. The state of Connecticut also implements a cap on how many magnet school seats it will fund, which also limits the number of open slots available to Hartford public school students. Tynima Toney, one of the plaintiffs, said she has dealt with the lottery system for years, trying unsuccessfully to get her son Zaiyre (8) and daughter Zynayha (7) into a magnet school. The Hartford Courant reported in 2017 that racial quotas were leaving empty seats in better-performing magnet schools and that the lottery system was bypassed in some cases in order for the school to obtain star athletes – a fact that was backed up by a Connecticut State Auditors report.